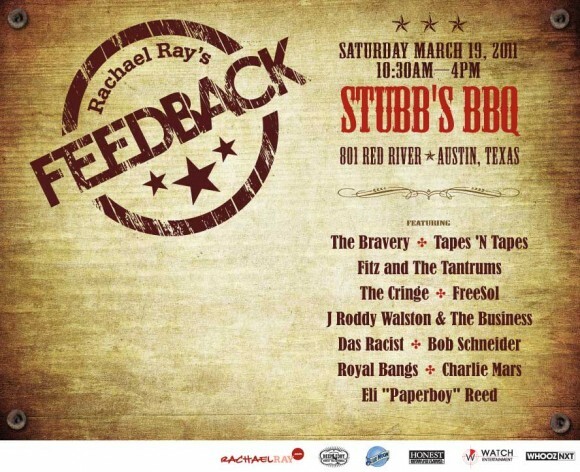 Rachael Ray’s Feedback 2011 SXSW day party will take place at Austin’s own Stubb’s BBQ on Saturday, March 19. Check out the full lineup and details after the jump. To RSVP to the 21-only event, click here. Also, to ensure admission, arrive early because the venue will close once capacity has been reached. Doors open at 10:30 and the event goes until about 4. Stubb’s BBQ is located at 801 Red River Rd, Austin TX.